Where better to learn to speak French abroad than on a French language course in Paris, France? Our Paris Opera school has a French language class for every level to ensure that you progress as the fastest rate possible in the company of fellow language-lovers from around the world! As you study French on your language course, you can visit the famous landmarks of Paris, with lots of opportunities to speak and practise the French that you learn in class. Paris is constantly changing, and everyone who comes to Paris to learn the French language will find something new each day to do and see. From the Galeries Lafayette department store, to the dramatic Georges Pompidou centre of modern art, it is no surprise that Paris is the most visited city in the world, and a wonderful place in which to study and learn to speak the French language abroad. Free upgrade on your French course in Paris! Our Paris (Opera) school is celebrating their 30 year anniversary in the language industry and want to share this happy event with all students! Get a free upgrade on any of the language courses offered by this school. This can be a full course upgrade, free workshop or free activity! Contact us for further details. Our Paris Opera school has two school buildings. The main building is located in the centre of Paris, just 10 minutes from the Salle Favart of the famous Opéra-Comique and within walking distance of the Louvre Museum. Situated on the first floor of a beautiful Parisian building, it is comprised of 20 classrooms, a study area, a cafeteria and internet access throughout the building. The school's second building is located on in the south of Paris, just a short walk from the Exhibition Park of Porte de Versailles. This building is only in use in the summer months where the family course, the Intensive morning course, and the junior course takes place. It is comprised of 30 classrooms, a computer room, student restaurant, a cafeteria and outdoor terraces. Our most popular course in Paris is the Intensive course of 20 lessons per week, which can be taken in the morning or in the afternoon, depending upon your preference. The Intensive morning course is available on specific dates throughout the year, whilst the Intensive afternoon course runs all year round. Please note that during the summer months, the Intensive morning course takes place in the school's second building, located in southern Paris. If you want to improve at a faster rate, take a Super Intensive morning course, consisting of 26, 30, or even 34 lessons per week! For a more personalised experience, take a course of Private Lessons. This is the perfect option for anyone with specific needs or interests and allows great flexibility in terms of schedule. You can also combine group lessons with individual learning, on a course of Super Intensive + Private Lessons and notice improvement in no time. If you are studying for a DELF or DALF examination for university or work purposes, a DELF/DALF Exam Preparation course is the perfect thing for you! Prepare for your exams with other like-minded students in a focused yet relaxed learning environment. We also offer a Business Course, which is ideal if you need to use French for work purposes or if you are interested in applying for a French-speaking role in a company. Gain skills that are indispensable in the world of business, such as presentations, interview techniques and so much more. In the months of July and August, we also offer a Family Course, allowing children to study French with other young learners in a dynamic, interactive environment. At the same time, parents have lessons in nearby classrooms with other adults. To enrich your knowledge of French culture, take a course of Super Intensive + Cultural Lessons course with us. Improve your general French skills whilst learning about French history and culture in afternoon workshops! Stay with one of the school's carefully selected host families for a first-hand insight into French culture and way of life. Choose half-board for a completely immersive experience or bed and breakfast for a little more independence. Our school also offers two residences: The Student residence which is available all year round and is located at Porte d'Italie, and the University residence which is only available during the summer months and can be found in Paris' Latin Quarter. If you appreciate your own independence but would like the chance to share a living space with other students and locals, opt for a shared apartment. These apartments are comprised of private bedrooms with shared kitchen, bathroom and living facilities. Whilst our Paris Opera school does not offer a specific activity programme, our colleagues at the school are very approachable and will be delighted to offer advice and suggestions for activities that you may like to arrange yourself! Whether you want to spend your time visiting Paris' many museums, such as the Louvre and the Pompidou; explore the Sacre-Coeur, Notre-Dame, or another of the city's impressive monuments; or take a trip outside of Paris to the Loire Valley or another nearby city, our school staff will be happy to help! Optional airport transfers can be arranged from Charles de Gaulle or Orly airport, which will take you directly to your accommodation. Please note that the transfer service is not included in the price and will incur an additional fee. Average score for our school in Paris (Opera) based on 56 previous client reviews. Brilliant course with brilliant teachers. A wide variety of grammar, written exercises and oral training. Perfect accommodation. Extremely comfortable and easy to get to. Lovely person (Marie) who was very welcoming. Going back to school after 55 years is a shock to the system, and I found it more difficult than the younger students. However my object to improve my comprehension and conversation was successful. Very comfortable living space and excellent cuisine, though for my taste not enough fresh fruit and green vegetables. Going to have to go on a diet now! Course material provokes an interest in French culture and current events which I had largely ignored previously. My curiosity has been stimulated and I am able to follow events on the Internet/radio and thus continue to develop my language abilities too. It was a very good experience, that I thoroughly enjoyed. The family that I stayed with were absolutely fantastic, I could not have asked for nicer people. We were looked after and fed very very well. I was made to feel so welcome, and it was lovely to have a family that could speak english so that if I had a problem then I could ask but otherwise we were able to converse in French. Would definitely recommend this accomodation to anyone that asked. The course was great, with structured methodology and an entry class that placed me exactly in the class I needed. The business course is very focused and the teacher (Valerie) is very well informed and dynamic. Accomodation was great and very cheap. I loved that each student is given his own room, complete with a bookshelf and a desk to study. However, it is a little far from the school (40 minutes by subway) and students should know this before booking. I will definitely book with you again! The course was excellent; very well-organised and an excellent level. Teachers very good indeed. I think it is good that only French is spoken and that there is no dumbing down - standard was high. Good variety of skills used too. The teacher Isabelle was great. She changed her exercises frequently and was fun. I learned a lot from her in a week. The class was only 6 people which was super. The building was a bit hot though. Good airco[nditioning] would be a nice extra. For the rest I was very satisfied. the level designated was done very good. The teachers were very good too. the subjects discussed which were indicated to me in advance were very well covered by the private sessions. The teacher, Nicola was able to set a very comfortable and relaxed atmosphere in the group and was creative in offering ways of teaching, a big thank you to him! Anne is excellent. Enthusiastic, interested & kind. Fredericke on the last day was excellent & I hope to see her again as my maison secondaire happens to be in a village she visits often. Mme Kovacshazy is highly intelligent and interesting. A very nice apartment. The course is very good, interesting and helful, professors are very competent. The family is good and nice, the house is near the school and services to get to school are excellent. The classes were well structured and interesting so I gained a lot during my time in Paris. The staff is always friendly and helpful. My instructors were very good and were always ready to help out when I was confused or had questions about the lessons. Lots of fun. I will definitely be back....hopefully next year. A Bientot! Total impression/ good expirience - personal attention specially - good contact with your office. Great location...close to everything. Fantastic teachers that are focused on improving your French. Lots of variety and fun in class! Students seem to be focused on learning too! The courses were excellent, the staff super friendly, and the teaching methods used by the teachers were very dynamic, different than most other traditional language courses and very effective. The teachers were simply excellent! The course was very good, I've learned a lot. The teacher was very motivating and I had a very good time! The course was very effective and I was able to vastly improve my oral French over the course of my stay. Apple Languages were very helpful before my departure and answered all of my questions in a friendly and effective manner. It was a good course, friendly people. I really enjoyed private one to one lessons. My room was presentable and had everything I needed. I enjoyed the french course very much. It was really what I wanted to learn: speaking french. The teacher was always very enthousiastic, even when it was really hot. She also helped us with difficulties and ambiance was very nice. I really would like to do a language course again, maybe Italian or french again. The environment is fantastic, teachers make the lessons good fun and they are encouraging and patient. Conversation and interaction was encouraged which helped me understand and speak alot faster than I would in a 'normal' course. I found the range of topics covered very good and the level in which I was put was right for me. I liked the way the classes were organised. General standard of teaching was high, with a couple of superb teaching staff. Overall, though, a very enjoyable and beneficial experience. It was especially useful to be taught by real French people. The teachers were for the most part very helpful and friendly. The host family was very welcoming and made me feel at home. I enjoyed the class very much, the teachers were very professional and kind. I stayed in a Hotel, just one block from the school. The rooms were large, clean, lovely. The staff was very friendly and breakfast was included. I had two teachers and both of them were absolutly great. The course was very well designed for me at my level. It was a great experience for me and I hope to do it again soon. Everything was as good as I could have imagined. The course was great. The teachers really cared and wanted us to learn. It was definitely a 'get out of it what you put into it' kind of course, but this is the best way to learn, as far as I'm concerned - no tests, because I'm here for myself, not to prove anything to anyone and not to earn credits, although they offer that option. I learned a lot not only about the French language but also the culture and pronounciation, which I think are equally important. The language courses and teachers were great, the location of the school was great too. I met a lot of great people. My host family was absolutely fantastic, very friendly, very helpful, and very French. The course was a very fulfilling experience. I made lots of friends, improved my language and now have work experience in Paris to put down on my CV. The teachers were very friendly, informal and informative. The lessons were often lively and humourous and they put everyone at ease to participate in lessons. The course was very interesting and well-organised. 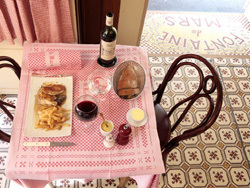 A Day in Paris…the Parisian way! Oh Paris how I love you!